With the grace of an ice skater and a large dose of self-parody, Marlon Brando returns in his largest (no pun intended) movie role in more than a decade. The Freshman stars Matthew Broderick as Clark Kellogg, a freshman at New York University's prestigious film school. 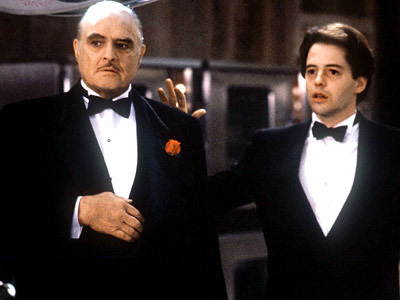 Broderick arrives in Manhattan from Vermont with a limited amount of cash, which he soon finds himself relieved of along with his luggage by Victor, an alleged cab driver (Bruno Kirby). Once Clark catches up with the Vic, he receives a job offer from Vic's uncle, Carmine Sabatini (Brando), a man who bears a startling resemblance to Don Vito Corleone, the character Brando won (and refused) an Oscar for in 1972's The Godfather. The plot's twists from there, while ludicrous, nevertheless add to the film's fun. The story's main thrust concerns Clark's first duty for Sabatini, picking up a rare Komodo dragon, an endangered lizard, from the airport. Overall, director Andrew Bergman's script (Bergman also concocted the similarly silly but satisfying film The In-Laws) doesn't matter as the film weaves its funny and satirical web from its performers. Paul Benedict, best known as Mr. Bentley on TV's The Jeffersons, brings great glee to his role as the tyrannical film professor who terrorizes Clark with comparisons of the philosophy of Kant to the Lake Tahoe scene in The Godfather Part II. Penelope Ann Miller provides some nice moments as Tina, Carmine's daughter who has an eye for Clark. Kirby, usually relegated to sardonic sidekick roles in Billy Crystal vehicles, gets to shine as Carmine's henchman who delivers every bizarre line he's given as if it's the most common thing in the world. Maximilian Schell also shows up for some hysterical scenes as a chef working for Carmine. Broderick is fine, though it's a bit difficult to believe that he is young enough to just be starting college. However, the film belongs to Brando, who mumbles memorably as he mocks one of his most famous performances. Every gesture, every expression that the actor makes shows why some give him the title of the greatest American film actor of all time (and make sure to stay through the credits to see him toss in a sendup of On the Waterfront as well). Even more impressive, he really does don ice skates and he soars around the rink with amazing grace. The Freshman is funny, light entertainment and screen appearances by the legendary Brando are too few and far between to let this one slip by.